The latest Quip electric toothbrushes have entered the dental scene and are making waves in the hygiene industry. Time Magazine categorizes Quip as one of the Best Inventions of 2016. 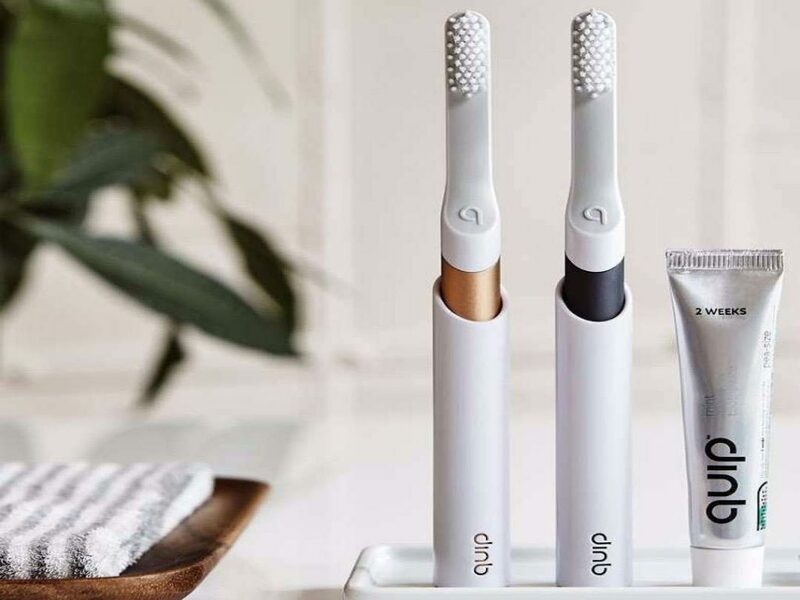 The Quip brush is the first ever ADA subscription electric toothbrush and is quickly becoming a household staple. Similar to the Dollar Shave Club for Men or Birchbox for Cosmetics, Quip is provides on a subscription-based service. For $10 every three months, you will receive a new brush head and toothpaste in the mail. It’s important to change your toothbrush heads every 3 months due to bristles failing and buildup of bacteria. Quip brings a beautiful solution to the table with a fresh brush head supplied every quarter. The Quip handle comes in a variety of colors with the ability to suction onto a mirror or other flat surface for easy access. The toothbrush runs on a AAA battery which is easily changeable by the consumer and will last for 3 months. This top of the industry brush is travel ready and stays charged as long as the AAA battery will last with no need for cords or a charging base. It is a vibrating toothbrush, not rotating, as vibrating toothbrushes have been clinically proven to remove plaque more efficiently than manual toothbrushes. The Quip also has a 2-minute timer that beeps every 30 seconds reminding you to move to another quadrant of the mouth. To provide some industry perspective, simple electric toothbrush sets starting at $25, making the Quip toothbrush a more cost-effective solution for consumers. The Quip offers a great way to keep up with your home care. Especially as a prompt to change your toothbrush head and to see your dentist for regular checkups. For more information about the Quip toothbrush, visit https://www.getquip.com/.